NASA Administrator Charles Bolden, left, and Assistant to the President for Science and Technology and Director of the White House Office of Science and Technology Policy Dr. John P. Holdren are seen during a press conference, Tuesday, Feb. 2, 2010, at the National Press Club in Washington, D.C.
NASA and President Barack Obama?s administration expectto spend months working out the specifics for their new plan for U.S. spaceexploration, even as some within the space agency mourn the loss of its currenteffort to send astronauts back to the moon. President Obama?s 2011 budget request for NASA cut theagency?s Constellationprogram completely, effectively canceling a five-year, $9 billion effort tobuild new Orion spacecraft and Ares rockets. The new space vehicles were slatedto replace NASA?s three aging space shuttles (due to retire this year) andlaunch astronauts into orbit and on to the moon. ?To people who are working on these programs, this islike a death in the family,? an emotional NASA chief Charles Bolden toldreporters Tuesday, choking up at times. ?Everybody needs to understand that andwe need to give them time to grieve and then we need to give them time torecover.? 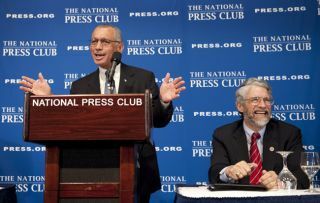 Bolden spoke during a presentation at the National PressClub in Washington, D.C., where he presented the winners of NASA?s $50 millioncommercial crew development competition. The winners, five companies ranging from aerospacejuggernauts to upstarts, will receive different amounts of funding to develop avariety of products, ranging from full-up commercialspaceships to the launch abort and life support systems needed to make themwork. Bolden said that he and senior White House officialsexpect to spend the upcoming months crafting a new overarching goal for NASA,one which is focused on developing the technologies and capabilities forsending humans beyond low-Earth orbit once more. Under Obama?s proposed budgetrequest, NASA would receive $6 billion a year for five years to supportcommercial spacecraft development. ?I?m not trying to fool anybody that this is going to beeasy,? Bolden said. Setting out a new long-range plan for NASA, he added,will take some time, but should not be drawn out. ?It is more than a couple of weeks, but less than years,?Bolden said. The NASA chief did not set specific deadlines ordestinations, but hinted that the Earth?s moon, the asteroidsand Mars and its two moons were on the list as targets for human spaceexploration. ?Anybody who talks about exploration beyond low-Earthorbit, there are some places that just naturally come to mind: the moon, Mars,asteroids and other near-Earth objects. So those are some of the definitedestinations,? Bolden said. But that list does not rule out other potential targets,he added. ?We hope very soon to be able to give you a verydefinitive time schedule that we hope to reach some of these destinations,?Bolden said. Doug Cooke, NASA?s associate administrator for spaceexploration, said NASA must remain focused as the Constellation programcloses down and shifts into a new phase of human spaceflight. ?It is difficult, to be perfectly honest,? Cooke said. ?It is difficult for those of us who have worked on it for a number of yearsand made sacrifices in order to make it successful.? NASA?s Constellation program workers will continue theirefforts under the space agency?s current 2010 budget, Cooke said. The shutdownswill come only after the 2011 budget proposal is enacted into law. But until then, NASA engineers are taking a close look atthe lessons learned from their five years pursuing the moon with theConstellation program. Cooke said he is optimistic that many of those lessons,and possibly some of the hardware developed, can be carried over onto the newpath. ?We will look at everything that?s been developed, bothin terms of studies and designed, and hardware, to see where it might be usedin the future,? Cooke said. Those knowledge capture exercises, he added, includethings like new computer models developed after NASA?s October 2008 test launchof Ares I-X, a prototype of its Ares I rocket designed to launch thenow-shelved Orion crew vehicle. ?We will learn from every aspect of this,? Cooke said.